Now this is curious, not to say confusing. 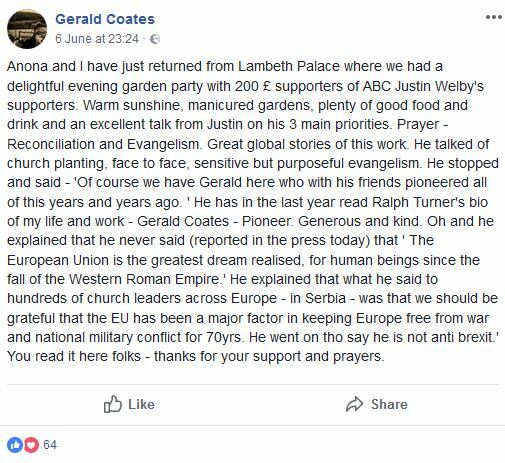 Gerald Coates is one of the most influential Christian leaders of this generation (genuinely): he is a highly respected, dynamic, credible and faithful witness for Christ, and has been for 40 years. 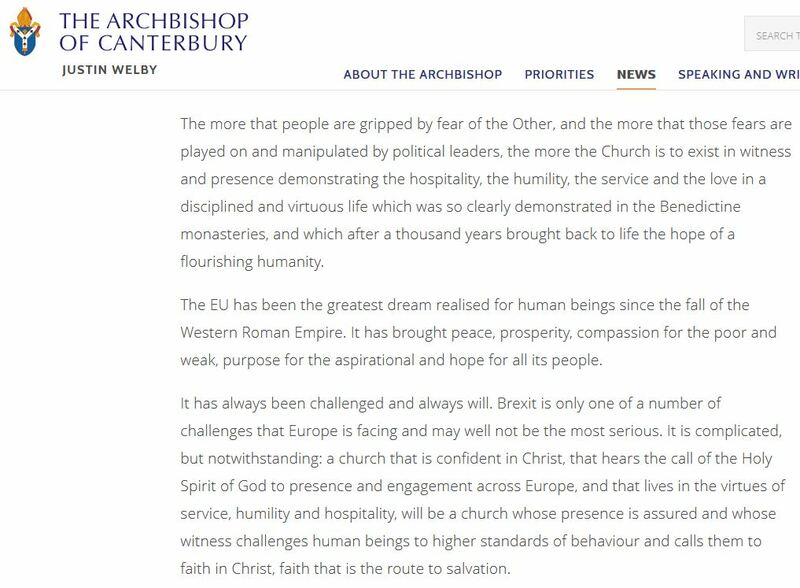 And here he is saying that Justin Welby never said that “the European Union is the greatest dream realised, for human beings since the fall of the Western Roman Empire”. So Gerald Coates must take a very dim view of the Archbishop Cranmer blog (if he’s heard of it), which faithfully reported these very words and took the trouble (which much of the mainstream media did not) to set the sentence in context – that is, Justin Welby’s belief that the EU “has brought peace, prosperity, compassion for the poor and weak, purpose for the aspirational and hope for all its people”. 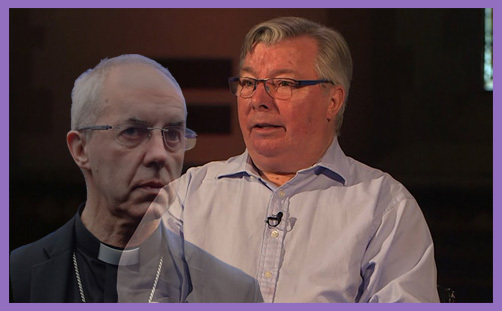 In this edition of Anglican Unscripted, Bishop Gavin Ashenden is scrupulous and fair toward Justin Welby, and impeccably gracious in his analysis of the ensuing confusion. It is not remotely likely that the Archbishop of Canterbury would have denied having said the very words which the media have attributed to him (Lambeth Palace Press Office would have issued a robust and swift correction): those very words may be readily viewed on the Archbishop’s own website. Much more likely is it that Gerald Coates misheard or only partially heard or perhaps misunderstood what the Archbishop actually said. He could easily have read it for himself and reflected a little before hastily posting his scoop on Facebook. It is therefore likely (indeed, more than likely: quite definite) that ++Justin was rather more nuanced in what he said extempore to the gathered great and good at Lambeth Palace – perhaps alluding to the inadequacy of the media coverage, and so denying their accounts of what he said because they didn’t report the whole context or grasp his intended emphasis. It is worth giving the Archbishop the benefit of the doubt here because the Facebook report is right in one respect: Justin Welby really is not (any longer) anti-Brexit, so there is a truth in what Gerald Coates reports. This is a fact (and it really is a fact) which none of the mainstream media have (yet) picked up on. Of course he hasn’t changed his mind entirely, but he is certainly not with most of the other bishops in yearning (/praying) for the decision to be reversed. He respects the referendum result, and is now concerned that Brexit should lead to a global Britain (as opposed to an insular one), and we can all agree on that. Perhaps Gerald Coates might confirm one way or the other (before his post’s hearts and thumbs-up grow further): is he absolutely certain that Justin point-blank denied having said: “The European Union is the greatest dream realised, for human beings since the fall of the Western Roman Empire”, and so lied? This is highly unlikely. Or is it that the Archbishop took issue with the media framing of this sentence because it was detached from his aspirations for peace and hope? Which is rather more likely. Still, we are left with division and confusion, doubt and dismay. And therein lies the sorrow.